1. 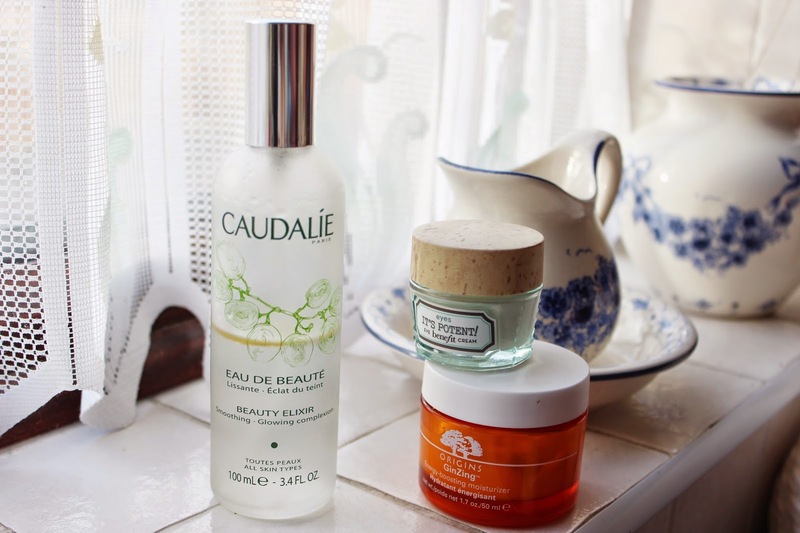 I start by cleansing as normal in the shower, then spray my face with the Caudalie Beauty Elixir. This is one seriously hyped up spray, but I do think it lives up to the acclaim by acting as the most gorgeous refreshing toner. The scent is an incredibly awakening zingy citrus, the spray application means it takes just seconds to use and not only does it tone, but also soothes and smooths which is great if hormones are wreaking any sort of havoc. 2. Next I get moisturising with the Origins GinZing Energy Boosting Moisturiser. Pricey for a moisturiser it may be, but my goodness is it lovely. I can't get enough of the fresh orange scent and way it blends so seamlessly into the skin. No greasiness allowed! It feels lightweight but is incredibly nourishing and protecting against those winter winds. My skin also looks like it's had a few more hours sleep once this baby kicks in. It's like a cheat that's totally allowed. 3. The final assault on sleepy skin comes in the form of Benefit 'it's potent!' Eye Cream. I slick this on in a thick layer underneath both eyes then leave it to sink in while I do my hair or drink a morning cuppa. That way it acts as an easy eye mask, brightening dark circles and feeling ever so cooling and refreshing on pesky puffy areas. You can even up the anti by keeping your pot in the fridge. Oh yes, nothing stops me from pushing the boat out. Do you have any morning skincare secrets? The Origins moisturiser is incredible! The eye cream from the same range is great too, it really wakes up the eye area and is really hydrating. Origins Ginzing moisturiser is lovely. It’s one of the products I finished up, but moved on to something else. But I quite often reconsidering repurchasing it! I haven't actually tried any of the 3 products mentioned but they all sound amazing so I may have to have a cheeky buy haha!